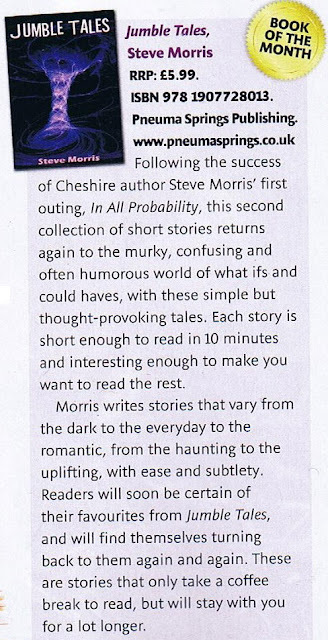 Our Guest is Steve Morris, author of 'In all Probability' and 'Jumble Tales' - both books are collections of short stories. Steve is a teacher of maths and science. Despite a background in mathematics and science, one major part of Steve’s life is his love of quality English literature. He collects and owns many classic first editions. Jumble Tales" is a collection of fatalistic, random chance-based tales and builds on my first short story collection "In All Probability", this collection is smoother, more mature, and better rehearsed. The aim is to step over established boundary lines of science, fiction and of plausibility. With a little romance and sport tossed into the spinning drum for spice. Book of the month - Country & Border Life magazine. Jumble Tales is the Book of the month in the January edition of the Country & Border Life magazine.